When Bookman and I crawled out of bed at 7 this fine Sunday morning the temperature outside was -22F/-30 C and the windchill made it feel like -35F/-37C. After the 6 inch/15 cm snowfall from Friday into Saturday morning on top of all the snow we already had, the arctic chill moved in along with the wind. Thank goodness for my wonderful neighbor with the snow blower who cleared the snow from my sidewalk so all I had to do was the porch and front walk, the deck at the back of the house, the path to the chicken coop, the coop roof, and a path to the bins and around them. Unfortunately, in spite of the heat in the coop and all the other winterizing we have done, the Dashwoods’ combs and wattles got a bit of frostbite. Except for Marianne, her comb and wattle is so tiny she was fine. However, when we put vaseline on the other three she got some too because we didn’t want her to be odd bird out and get picked on for being different or feel like she could pick on the others for being different. She was not happy about being included in the fun, let me tell you. And she is really pissed off about the weather too. She’s been in a foul mood (pardon the pun!) all day. Every time Bookman or I go out to check on them, she will see if there is any food and if there isn’t she will turn her back and tuck herself under the ladder to the coop and completely ignore everyone. Mrs. Dashwood is trying to carry on as usual. Elinor is trying to keep a stiff upper beak even though things are not as pleasant as she would like them to be. As for Margaret, she stands in the middle of the coop one foot tucked up, feathers fluffed out so she looks twice her size and making her usual perpetually worried noises. We keep trying to get them to roost so they will be warmer and even put the lower roosting bar back in the coop. But with no other chickens to show them what to do, they will have to figure it out themselves and so far none of them have. If it weren’t so cold we’d open the cleaning door on the side of the coop and set them on the roost, but that would let out all the warmth. So we added extra pine shavings on the coop floor and we’ll hope that one of them has a lightbulb moment. The temperatures will start to moderate tomorrow and by Solstice on Wednesday we will have a high temperature close to freezing, maybe even a little above. Practically balmy! The garden is under quite a lot of snow and it is the coldest it has been here in three years. That is really saying something since when I first moved to the Twin Cities temperatures like this were an expected part of winter. Granted, they didn’t come around until the end of January and early February, but they happened for a week or two every year. We’ve warmed up so much from climate change that such frigid temperatures are no longer the norm. I hope my grapevine survives! I mulched it with a big pile of leaves and now it is buried under the snow that will also give it some protection. Nothing to be done for it except wait for spring at this point. I might have to repopulate the herb spiral next year too. And whatever manages to survive on the green roof of the coop will find some cousins of the same variety joining them in spring. 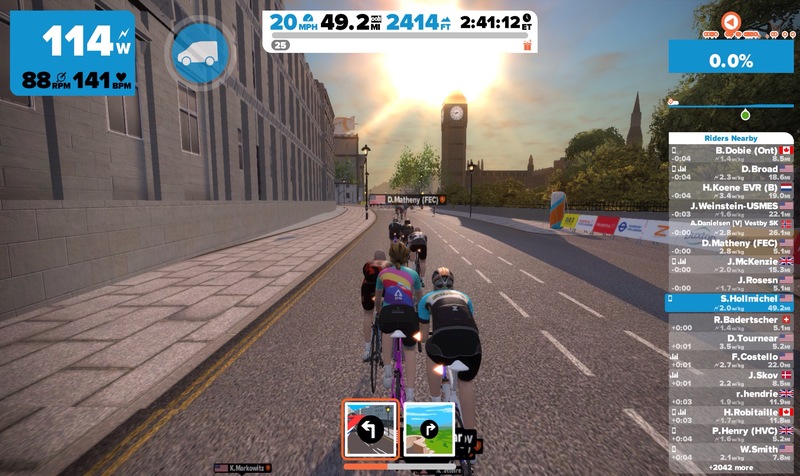 It might be snowy and arctic outside but in Zwift London Saturday morning is was sunny and 65F/18C (the daytime house temperature in winter). I rode for 4 hours and 42 minutes (from the time I got on my bike until noon) and managed 87 miles/140 km. Not too shabby! There were lots of other people logged in and riding too. At one point there were a little over 2,000 people logged in. I came across some really exciting cycling news not long ago about Jillian Bearden, a transgender cyclist. She is working with USA Cycling to help them make racing and cycling more trans friendly. USA Cycling has decided to adopt the same policy the International Olympic Committee created for trans athletes to ensure a more inclusive cycling and racing community. There is even a Trans National Women’s Cycling Team. Exciting! With Winter Solstice fast approaching, posting this week might be a bit spotty. I am sure many of you are also very busy at the moment. Don’t forget to breathe and stay warm or cool depending on what hemisphere you live in! The poor Dashwoods! Mine don’t like the cold much, and don’t like to go outside if the air is too cold, or if it snows. I’m going to drop a couple of links for you to look at, in regards to keeping your chickens warm in the winter. They’ve helped me immensely. Deb, thanks for the links! We’ve got the brooder light fixed to the rafters of the coop and have only turned it on this weekend when temperatures dropped from 5 above to 20 below and stayed below zero through this morning. It takes the edge off but it is still pretty darn cold out there (their eggs freeze solid if we aren’t home and don’t get them right away). In spite of the cold and snow they still rush the run door to try and get out and get mad when we don’t let them. But since it is supposed to warm up to freezing later in the week we’ll let them out for a bit if they really want to wander. They are going to be surprised about all the snow and may change their minds about being out! I always open the doors. I believe that no matter how cold, no matter what the wind or climate, I should make the offer and let them decide if it’s good enough to venture out. Sometimes only one or two go out. Sometimes none. Sometimes it’s split between the older and younger members of the flock. Double Dots, Abby and the RiRs all hate the cold and rarely go out. Pip and some of the younger hens will go out and stay out longer. We have a place for heat lamps in the rafters, too. I keep them for negative degree weather and only if it gets that cold inside the barn. (Our coop is built inside a retired dairy barn, so it sometimes stays slightly warmer.). Deb, we open the pop door to the coop and they can go out in the run if they want to, which they usually do. It’s not the same as getting to free range in the garden though. It’s nice you have a barn with the coop inside. Our coop is outdoors and exposed to the elements which this far north makes things interesting! Poor Marianne….she did not like Vaseline and all you wanted to do was not make her feel odd…LOL! Very interesting about Jillian Bearden. Changes are happening very late, but at least they are happening!! All the best for your Solstice Cooking Bonanza! cirtnecce, none of them liked the Vaseline but Marianne was the grumpiest about it! Bearden’s is a really interesting story and she has gone through quite a lot. It is good that changes are happening but as you note, it sure has taken a long time. Why do I suddenly have a picture of you and the Mr in bed with the Dashwoods and the cats? It’s warming out here right now, maybe the thaw will head your way. We haven’t had too much snow though, just brutal cold. I feel for the Dashwoods in that brutal cold. I hope the thaw comes soon for them. Ian, I’m not sure we will get a thaw but it will certainly be close enough for everyone that it will feel perfectly wonderful outside! roughghosts, ha! That would be pretty funny except the Dashwoods definitely aren’t house trained! The forecast is teasing us with 1C on Wednesday! Even if it doesn’t warm up that much it will still be significantly warmer than it was over the weekend! Maybe penguins would have been a better choice, except they wouldn’t like the hot humid summers. Many of us don’t like these temperature extremes. A virtual bike ride through London sounds great! I’d never dare that in the real city. Have a very happy Solstice and a wonderful 2017 to you and Bookman! Joan, heh, yeah penguins would love the winter but not so much the summer! I’m not sure I would dare ride a bike in the real London either. There are brave souls who do though! Or maybe you could make little hats for them to protect their combs and wattles. Could be a lucrative market for them! Awww, the poor Dashwoods! It’s been cold where I live, but not quite that cold. I’ve been a huge baby about it, though. AMB, the Dashwoods will be getting warmer weather and a special treat for Winter Solstice Wednesday so that will help their attitudes 🙂 I will also be glad for the warmer weather! The poor Dashwoods! We’re finally getting coolish weather down here in Louisiana (AT LAST), but it’s nowhere near cold enough to give poor little chickens frostbite. Poor little chickens! If only they were better at being chickens so much of this could be avoided — at least they have you two taking care of them and looking out for their best interests. Poor Dashwoods, I was wondering how they would deal with the cold–like the rest of us it sounds like they are not much pleased by the subzero temps! How funny, though, that they have such particular personalities! Yay, you are on your break now–I hope you have lots of time for reading and cycling! Danielle, they were just as distressed but the subzero as the rest of us! They each have their own personality and it is really delightful. Yes, on break now, hooray! I think you are too? I hope you get lots of reading time as well and stitching and weaving. hey, maybe I will finally pull out that sweater sleeve to work on!